It's the dream of any antique collector: You impulsively spend a few bucks on a trinket at an estate sale or an antiques store, and later discover that it's worth more than what you paid for it. Much more. And that's pretty much the dream that came true for a 79-year-old British retired worker from the Cadbury chocolate factory, who recently walked into an auction house with a near-perfect Ming vase in a cardboard box. It's unknown how the man, who wanted the press to refrain from publishing his name, came into possession of the rare vase, but staffers at Duke's—the Dorchester auction house that took it in—were astounded by the "spectacular find." "When my colleague initially showed me what had arrived in a cardboard box I could not believe my eyes," Guy Schwinge of Duke's told the Guardian. "The vase is in perfect condition, and it is amazing to think that it has survived unscathed for almost six hundred years." The BBC reported that the vase, which stands 11.5 inches tall, is the largest ever found of a rare group of early Ming "moonflasks" whose production dates somewhere between the years 1403 and 1424. That means it was manufactured during the reign of an emperor named Yongle; its distinctive features—such as the small loop handles—appear to be influenced by Islamic design. 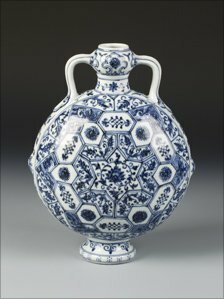 Because the vase originates from China but shows the influence of Middle Eastern craftsmanship, auctioneers at Duke's expect the vase to draw the bids of wealthy collectors from both Asian and the Arab worlds. The auction is scheduled for May, and the item is expected to fetch at least a million pounds, or roughly $1.6 million U.S. dollars.